First, I have to tell you, I’m not much of an outdoor girl so my knowledge of cabins is limited. I’m more of a hotel/condo kind of vacationer. I tried to imagine though what I would want in a cabin. Two things came to mind. Definitely it would need a rocking chair on the front porch to sit and watch the sunrise. And it would have to have a fireplace to sit and sip tea by. Or maybe read a book. And a bathroom. Got to have a toilet and a shower! Like I said, I’m not really a roughing it kind of person! All the cabins I’ve seen around here are made of stone. That’s something we have plenty of in Arkansas. Stones, rocks, boulders, and more stones. So my little cabin is made of native stone. If you’ve read this far, I hope you will wander over to Michael’s challenge this week and see what other’s have come up with. 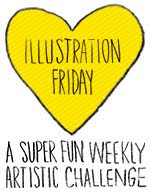 Next week’s theme is “Umbrella” if you want to start working on something and join us! I like that your cabin is made of stone, and the rocking chair, definitely need one or two, so very nice place to have a vacation at, great take on the theme. beautiful stone cabin Sue! You did a great job, and I am also a (luxury) hotel kind of person lol. It's such a beautiful picture and I love your line work. Beautiful. I really enjoy how you did your lines to breathe life into things. It is a sweet stone cabin. The rocking chair is a nice touch. Beautiful line work. There's so much interest in this. Love that you went with a stone cabin. I love your pencil work. I took one class in pen and ink doing the cross hatching and little lines. It was fun. Interesting you would have stone cabins - we have wood ones up in Ontario, Canada. Although we live on the Canadian shield and have lots of rock too. Sue, you;ve done a fabulous job here. I love it when people, lke yourself, are adept at different line work and patterns to distinguish areas, all whilst keeping to one pen and colour. Hard to do and something I've tried before and never been too happy with but this is great! Love your sky, how it looks like a wood carving almost. It's a really inviting, wonderful piece and exactly the kid of things I would want in a cabin too, as like you, I am soooo not a camping or outdoors roughing it kind of person. No, I need : A"Got to have a toilet and a shower!" --Absolutely! :D I could definitely see us all over here, basking in a picnic revelry, jsut as long as you and I got first dibs on the rocking chairs! Let the roughing it people do just that--rough it! :D hahaha. Thank you for this lovely entry to our theme and for the heads up to next week's too. So glad you are back here with us. Really am. This is an adorable cabin and you have made it look very inviting. However, like you, I'm more the hotel/ship's cabin type, not so good staying in woods because I'm allergic to mozzies and such! I love how you rendered the trees, boulders and smoke, and if I spray myself with OFF I could probably rock in the chair on the porch for a little while. I will do almost anything for a sunrise view! Lovely - and thank you. Great use of lines; and I'm glad you nailed down the porch floor boards! What a gorgeous wee cabin! I am definitely in favour of all the necessities you want for your cabin - like you, while I love the great outdoors, I don't particularly like roughing it and a bathroom/toilet would be essential!! 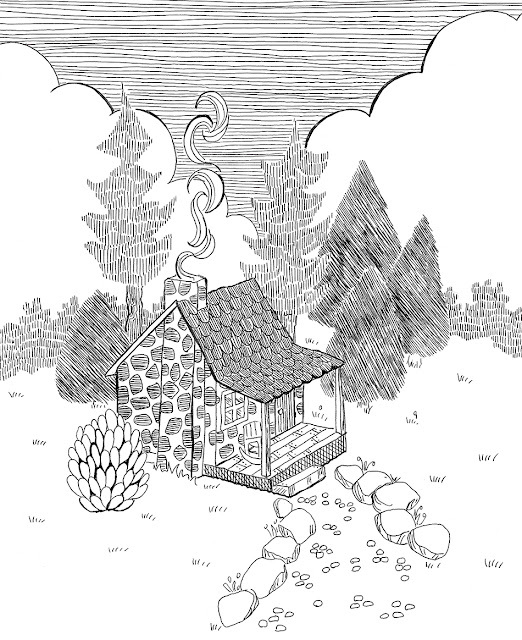 oh, and your sketch is gorgeous - I love the way you achieved the texture in the trees with the varying line work! Just love your line work, really really effective especially with the smoke. I am with you on the creature comforts. Fabulous job.